Now in its 27th year, the Saskatchewan Jazz Festival has grown to be absolutely massive. With a festival of this size and caliber comes a hefty fifty page festival program. Fortunately for those of you with an Android or Apple device, you can get all of your festival information served up right on your smartphone with the festival’s free app. This year the festival has cooked up more free stage festivities than ever. 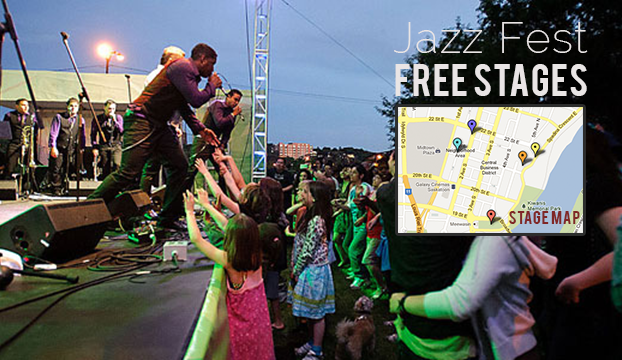 In fact, there’s so much to do it will be tough to decide where to get your free jazz fix. Have a look at the Pickup’s full guide to the free stages to decide where you want to spend your time. The jam-packed Saskatchewan Jazz Festival lineup was released on Friday and if one thing’s clear it’s that jazz fans and live music lovers of all kinds are in for a sensational nine days. I only planned to watch Scott Bradlee and his friends jam for a few minutes. Maybe catch a song or two and throw in a request that would probably be ignored. I ended up watching — and participating — for two hours. Here’s why you should give this kind of show a shot. Free jams are the best things. This applies to musicians and music fans alike. Never been to a jam? Here’s why you should try it out, and where to get started.